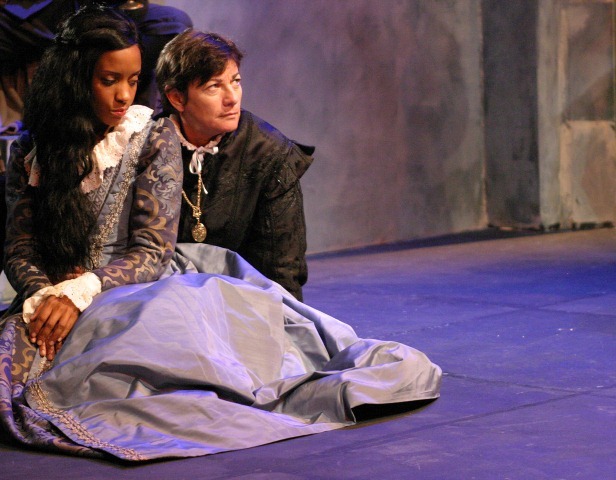 You will not find a more impassioned version of Shakespeare’s Hamlet than the one Los Angeles Women’s Shakespeare Company is currently offering at the Odyssey Theatre. And with the very real possibility that this may be the company’s final work comes the necessity of experiencing what these dedicated professionals have created while under the influence of Shakespeare’s words. I had the good fortune to see Lisa Wolpe, who returns to Hamlet in the title role, when she played Richard III at Cal Poly Pomona in 2011. She is an actor who disappears into whatever character she portrays so completely that you forget the most obvious fact – she is a woman playing a man – and instead simply see the journey of a person. For Richard it was his calculated ascent to power; for Hamlet it is the unraveling of his mind in the quest for revenge. Cross-gender casting was the norm in Shakespeare’s day and LAWSC employs it in reverse with women taking on all the parts in their productions. While Wolpe certainly leads the charge in how to skillfully accomplish the task, veterans like Cynthia Beckert and Kimberleigh Aarn are also ably suited for their roles as the hotheaded Laertes and steadfast Horatio, respectively. As Polonius, Natsuko Ohama finds an understated humor in the stately gentleman’s penchant of running on at the mouth, and Linda Bisesti’s Osric brings a chuckle every time he appears in his foolish hat and pencil mustache. On the flip side; there’s a lot of acting going on by others who don’t trust that the text will do much of the work if only the actor will allow it to be so. Is passion necessary? Yes. But there are times it feels pushed over the limit, as though without displaying a trembling intensity or shouting we won’t understand how distraught an actor is. Oddly enough the swordplay, which should be full of passion, feels executed by the numbers – perhaps for the sake of safety (Beckert’s work the exception). Don Llewellyn has created a rich Danish castle with beautiful detail and A. Jeffrey Schoenberg’s costumes are magnificent. I was also struck by how Cricket S. Meyer’s sound design underscored Hamlet’s speeches in his moments in the garden. The innocence of quiet birds singing against Hamlet’s increasing disgust that his uncle now sleeps with his mother as king gives the scene a bitterly ironic edge. If indeed Hamlet is to be the final LAWSC production in L.A. then you would be wise to experience it before the end of its run. 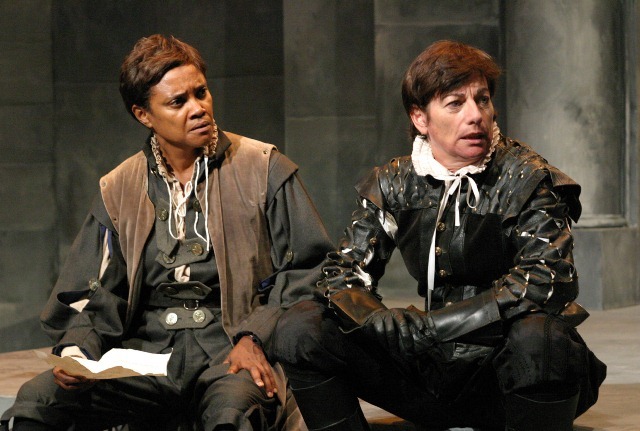 Wolpe is one of the great stage actors of our generation who breathes life into Shakespeare’s words as though they were dredged from her own soul. I marvel at the accomplishment. If any of you artists: directors, actors, designers, have some free time- the Drama Teachers’ Assn. of Southern California could sure use your assistance in juding some of our festivals! Please consider signing up. Even if you can’t make this particular event, your name will be saved and you’ll get emails for future events as they come up. The honorarium is small ($15 per event) but the company is great. This is an invitation to judge at the DTASC Fall festival for high school students (Division C). RSVP on or before October 17 2013. Complete #1-7 answers and send only the shaded answers to gaijones@ix.netcom.com. No need to respond if you cannot judge. Saturday, October 26 Fall DTASC THEATRE FESTIVAL. Judges must be 21 years of age or 4 years out of high school. Please do not respond if you are not appropriate age. Please only respond if you CAN JUDGE that date and are willing to drive to the location. and/or full sessions ( 7:45AM-6PM). DIRECTIONS: If heading from LA, exit Valley Circle Blvd, make a left. Valley Circle becomes Mulholland Dr. If coming from 101 north, exit Valley Circle; make a left on Calabasas Rd then a right onto Valley Circle/Mulholland Dr. Make a right onto Valmar. Make a left onto Mulholland Hwy. School is on the left. Judges may park in the front staff parking lot. Acting categories & Technical presentations. Categories will be explained onsite. Information about the Fall Categories may be found on http://www.dtasc.org/. You must complete #1, 2, 3, 4, 5, 6, and 7 below to RSVP affirmatively to gaijones@ix.netcom.com by Oct 17, 2013. Do not send resumes, attachments, bios. Any incomplete form will be disregarded. Please clear any calendar conflicts before RSVPing affirmatively. a complimentary lunch as tokens of our appreciation. Judges’ committee will be ready to distribute priority colored slips based upon your arrival time at 7:30 AM. based on “arrival” priority colored slips. These priority colored slips will be implemented for assigning rounds one, two, semifinals and finals in the AM/PM hours. We are looking for Technical Design judges, as well as Acting Judges. A judge may not evaluate the same event for more than one round. There is a limited number of Finals judging spots. Arrival after 8:15 AM will result in no judging assignment for you for Round I. You must attend the Onsite Judges’ Training at 8:15 AM, Sat. Oct. 26, 2013. Return only this RSVP SECTION PAGE by Oct 17, 2013.to gaijones@ix.netcom.com no later than October 17, 2013. I will retrieve DTASC messages from my Earthlink Suspect E-mail file daily. You’ll receive judge’s confirmation and more information by e-mail. Make a copy of the information. *I am a qualified theatre festival judge and will write Share Sheets with constructive comments for young Theatre students, their teachers, and parents to read. I can also hear any performer from a distance of 25 feet. I feel qualified to judge Acting or Technical categories for contemporary plays. Please mark one, unless you are qualified to judge both acting and technical. 7. List any affiliation to any middle school or high school which might be entered in the festival. Affiliation includes teaching at, a parent of a student at, working/coaching with any student at in an after school or summer program. List any middle school or high school with which you have any affiliation_____________________________________Failure to indicate a school and your judging any event which includes that school will result in disqualification of the school. Respond no later than October 17, 2013, to gaijones@ix.netcom.com. Once you respond affirmatively on or before Oct. 17, 2013, you are scheduled to judge. If you do not RSVP by Oct 17, 2013, you will need to sign in onsite at the festival. Approximately one week before the festival date, I will send more e-judging instructions. Thank you for the invitation Jane. Go students!